Over 4 years ago Price and I spent Memorial Day Weekend in Rockport, MA. We stayed at the Sally Webster Inn, a cute B&B that is walking distance to the historic district. While there we had this sweet, sticky, yummy breakfast… it was the first time we ever had Monkey Bread. We had never heard of it before so we eagerly asked what it was and how to make it. Our inn keeper told us how simple it was to make so we decide that we must try it at home later on. I have made it several times since but I don’t typically make it at home since it makes a lot, I have even cut it in half when we have had a few people stay over and it is a lot. Plus, let’s be honest, it’s not really healthy…. you’ll see. Every friday my office has this thing called Pod Breakfast. It just means that 1 person brings in breakfast for our different pods (sections of open workstations). So today is my turn for Pod Breakfast. Since I started working at Gensler 3 years ago Sept I have made Monkey Bread for all but 1 of my turns. I’m kinda sad that I missed that one but I know at the time I correctly choose sleep over getting up early to bake. I make Monkey Bread and either make something else or purchase something else. I have done everything from a large fruit salad to McDonald’s breakfast sandwiches. So I had to decide what my other item would be… since we just made waffles last weekend I had that on the brain and settled on that. I got up at 6 this morning (luckily I did not snooze for 30-40 minutes like usual) and went to the grocery store to get all the supplies I would need for monkey bread and buttermilk waffles. Making the monkey bread was easy, like usual, and prepping for the waffles was a breeze however I put the eggs in the fridge and forgot them at home. Damn! I was so annoyed since I had to run out to the closest convenience store to get eggs. Just another thing to juggle this morning. The big scheme it was not a big deal since I made 3 batches of waffles but it slowed me down at the start. Once I got going everything went smoothly- I think I ended up making 45+waffles- which were served with syrup, strawberries, and whipped cream. I sent up a table for the monkey bread and the waffle prep. The monkey bread was a hit since it is a sugary, buttery, sweet breakfast bread. I felt bad that I forgot to invert it since I was so busy with the waffles but it was still good. Inverting the monkey bread allows the buttery ‘caramel’ to sink back into all of the pieces. pre=””>Preheat the oven to 350. Use a bundt pan or a loaf pan for the monkey bread. Spray with nonstick cooking oil. 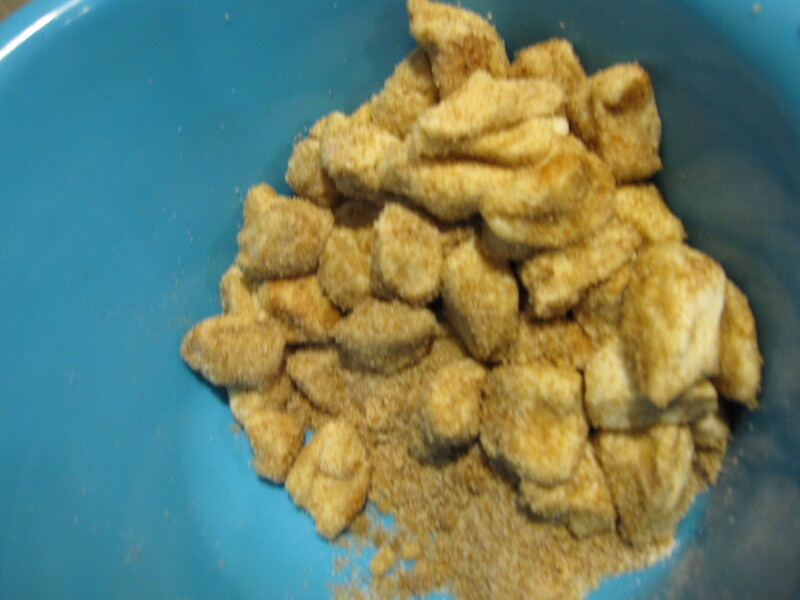 In a large bowl mix the sugars and cinnamon together. Using clean, sharp kitchen scissors cut every roll into 4 pieces. While you are cutting the pieces melt the butter. 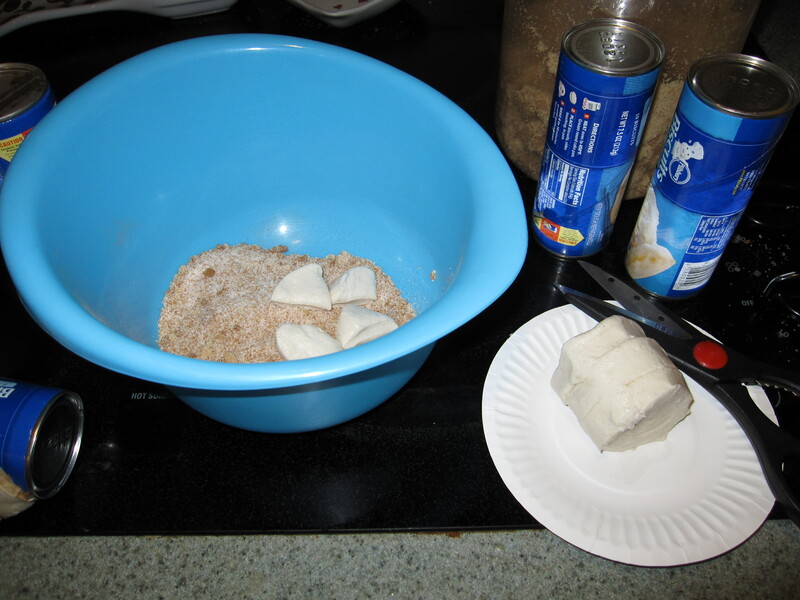 Roll all pieces in the cinnamon sugar mixture until coated. Place all pieces in the pan. Pour the butter overall the pieces. Cook for 30 minutes. 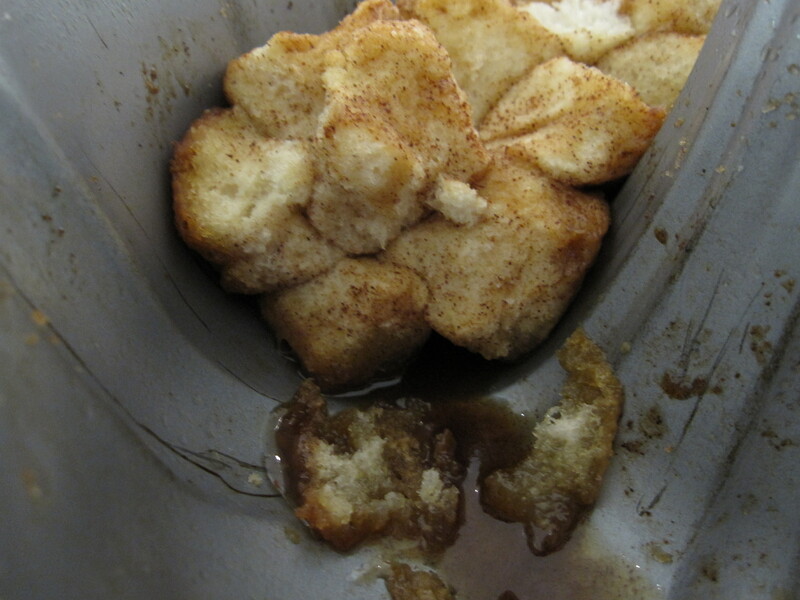 be sure to check on the monkey bread so it does not brown to quickly. Invert the monkey bread onto a plate, serve warm.